wireless device, or face-to-face contact. In todays economic climate, Businesses of all sizes are realizing the fact that a sustainable success in their industry can only come from a satisfied customer and partner base. Therefore it is wiser to focus efforts on having a clear customer strategy, and a robust IT system to support this strategy. It is important to realize, measure, optimize and increase customer and partners experience at levels of engagements in order to be ahead of competition. INFOSIGHT leverages its rich CRM Solution expertise across various industry segments and helps Businesses to create a platform for their effective customer interaction using all touch points – mobile, social, fax, e-mail, Web, wireless device, or face-to-face contact. 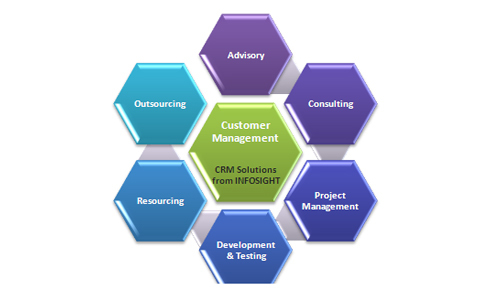 INFOSIGHT also has expertise in establishing Integrated front and back office enterprise applications for your business functions, as well as with those of your external suppliers and business partners to help clients implement CRM solutions that can attract and retain their customers in todays competitive market. We also recognize the need of having clear customer strategy before embarking with implementing CRM Systems. We have been helping our customers to evolve business strategy around their customers & partners before translating it into processes and solutions. While designing the solution we also make sure that the industry best practice is critically evaluated and adopted where possible. Our ranges of Services address all aspects of your CRM Solution requirements, to effectively manage your Customers, in order to realise your Business objectives. SAP CRM BAiO: CRM solutions using SAP Business All-in-One which can bring the same benefits of Large Enterprises to SME. Our fixed scope solution covers Marketing, Integrated ERP sales, Service and Customer Interaction Centre. Our accelerated implementation approach brings substantial cost reduction in overall implementation & support and can still deliver benefits that Large enterprises enjoy with their big budget CRM programs. SAP CRM RDE with ERP: CRM Rapid Deployment Solution along with ERP Integration. This product suite comes with simplified & attractive licensing fees from SAP specifically designed for SMEs. INFOSIGHT solution offerings using this product are flexible, scalable and very cost effective. We offer fixed price implementation bundled with required user license fees that can transform your business into a customer centric organisation with effective Marketing, Sales and Service processes and solutions. This solution comes with seamless integration with your existing or a new ERP system. SAP CRM RDE Standalone: CRM Rapid Deployment Solutions for Standalone Edition. This product can run as a stand-alone solution without requiring ERP system and can still deliver all the CRM benefits that other CRM solutions can deliver. Our fixed priced offering enables effective Marketing, efficient Sales and better Service processes, which can deliver substantial organisational benefits with a minimum IT spend. Our solution offerings are flexible enough to pick and choose and yet scalable to add additional functionalities when your organisation demands and the budgets permit. SAP CRM ByDesign: CRM Business ByDesign is a SaaS (Software as a Service) based hosted solution offered by SAP for SMEs. Our expert consulting can help you to embark with such hosted solution without having to spend on any infrastructure and software. Our offering gets you up and running on a SAP hosted CRM solution quickly and continue to grow and reap the benefits of best practices applicable to you. MS Dynamics CRM for on premise or cloud or a hybrid combination solution to address sales, marketing & service requirements of SMEs.